In modern cities we often forget the intricate relationship between urban and rural areas for the numerous resources we take for granted, including food. Every day, enough food has to be brought in, sold, cleaned, cooked and disposed of for circa three meals a day/ inhabitant. In a city the size of Amsterdam (population 820,000) that’s roughly 2.5 million meals. This same situation occurs in urban areas, the world over. Organizing such an influx and outflux of food and food waste is hugely complicated. Still cities undertake this logistical feat, every single day. Mostly though, this goes unnoticed by urban residents who take for granted that food simply appears in supermarkets and restaurants, not necessarily connecting to where exactly it has come from (near or far). Historically though, the design of a city was influenced as much by its relationship to food, as its surrounding geography and politics. It was the relationship between food and cities that first got architect and author Carolyn Steel’s attention. She published ‘The Hungry City’ which closely examines the historical relationship between food and London, with lessons for cities the world over. With a dose of humor and filled with colourful stories, it clarifies some of the traditions surrounding food we still practice today. Steel has shared this message at various events, including TED talks (below) and inspired other cities to do the same – including Amsterdam. In Amsterdam, the grain trade became particularly important for the city; in part because of a Dutch innovation in ship designs (which facilitated the transport of large amounts of grain) and in part because the city (surrounded by bogs and wetlands) needed to import grain to survive – and then developed this into a business model. Grain became the mother of the city’s wealth and influenced its reputation as a leading food trader. Moreover, as trading food is more profitable than growing food, the city became rich. In 1611, an international stock exchange was established in Amsterdam, bringing traders from across Europe, Russia, Persia and India. Meanwhile, the Dutch East India Company (the first multinational in the world) became famous for its spice trade; however it also was the leading grain trader. In Amsterdam, trade in food led to the modern banking system, paving the way for the introduction of capitalism. Still today, the Dutch are heavily involved in global trade, including food trade (e.g. think Unilever). The connection between food & cities is a fascinating one, and generally under appreciated – in terms of its historical and political influences, but also its environmental and social consequences. Despite being the coldest 24th of March on record, it was an interesting and engaging tour, where I learned many things about the city I currently call ‘home’. Next time I walk down Kalverstraat, I will remember that this is where the cows entered the city on the way to the markets, either to be sold to farmers to be fattened or to butchers to be slaughtered; today it’s a shopping street. I will remember that Warmoesstraat is thought to be a historic word for vegetables and an important street for the vegetable trade; today it sits in Amsterdam’s Red Light District. 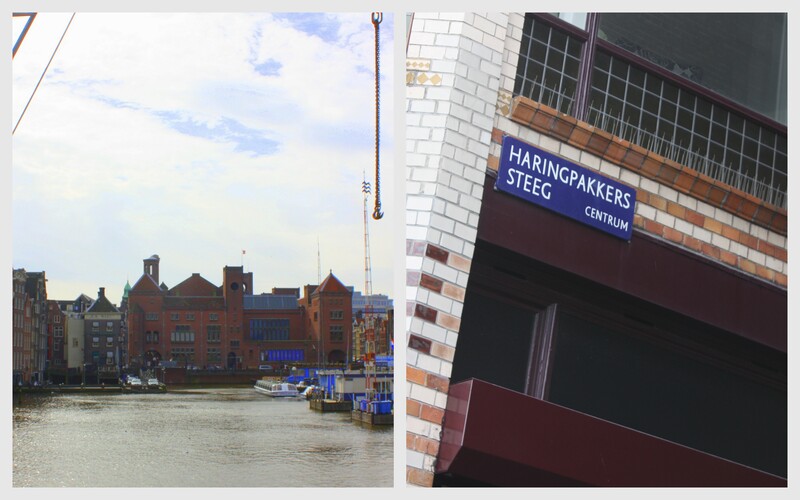 And certainly I will remember that Haringpakkerssteeg was where herring was inspected upon entering the city; today it is home to tourist shops and hotels. Many of these historic food connections between the city and the countryside changed, after the invention of the railways and modern transport. This was particularly important concerning meat preparation – animals no longer came to the city, shifting our relationship with animals, and detaching the living animal from the end (meat) product. CITIES offers a second tour, focusing on food transitions in the industrial age; I can’t wait to attend! Living in Amsterdam, or traveling through the city? 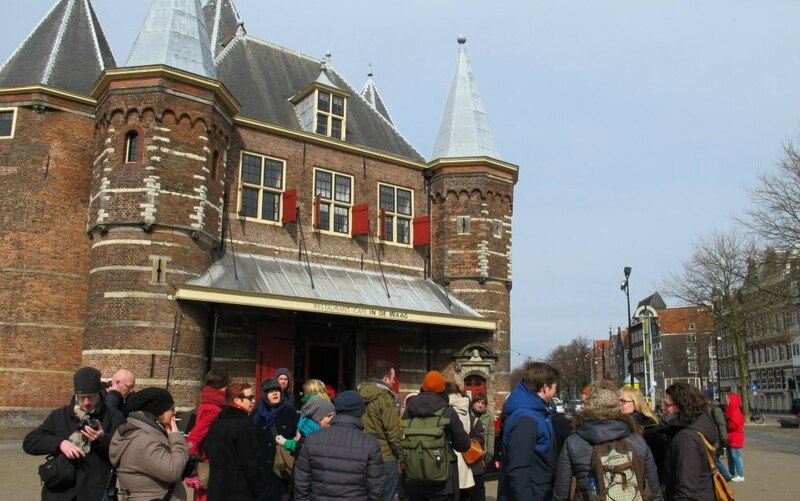 If you can, sign up for one of the next Amsterdam Food City Tours and learn about an important part of the city’s history (and current) relationship to food! The Waag was a 15th century city gate which later became a weighing house for food entering Amsterdam. By weighing food, city authorities developed a system of standardization & regulation. In fact, systems of public works and local administrations were developed to manage food, including irrigation and distribution already for the first human settlements of Mesopotamia, circa 9000 BC. Historically meat was expensive and mainly unattainable. Fish then, was an important source of protein – herring one of the most commonly consumed. 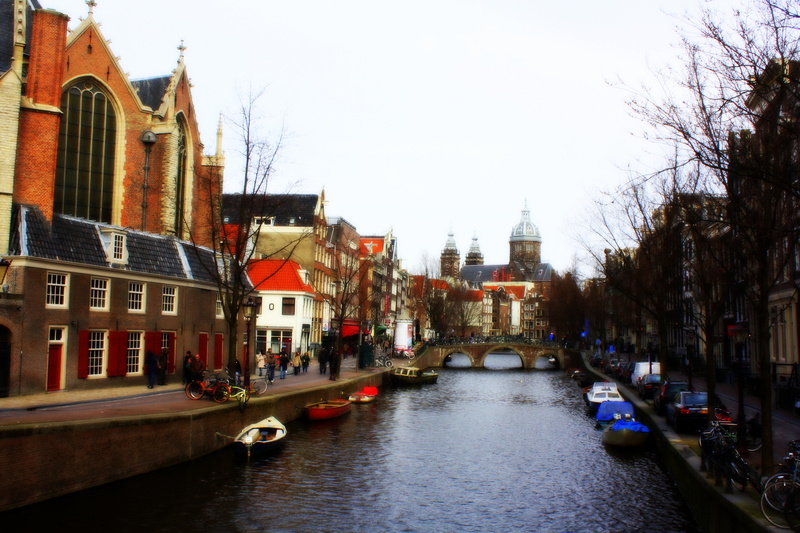 It is rumored that Amsterdam is built on herring bones. Close to the city centre and old harbor (near Damrak today, see left photo) lies Haringpakkerssteeg, wherein fish packaged in large drums at sea were inspected before being sold to the city. With many of the best waters for herring fishing in Scandinavia, herring boats often traveled for days and it was important that fish could be preserved. The herring trade was also an important trade product in the Hanseatic League. Cows were often raised in Poland or Denmark, and then walked to Amsterdam. When they arrived to be sold in the market, these cattle were famished and skinny from the long journey. There were two meat markets per year: spring and autumn. Cows were sold to local farmers in the spring, where they spent the summers being fattening (on grasses or spent grain from beer production). In the autumn markets, they were sold again; this time to the butcher. As most families could not afford fodder, meat was a seasonal product; with most (Christian) families only eating meat three times a year (during religious holidays). 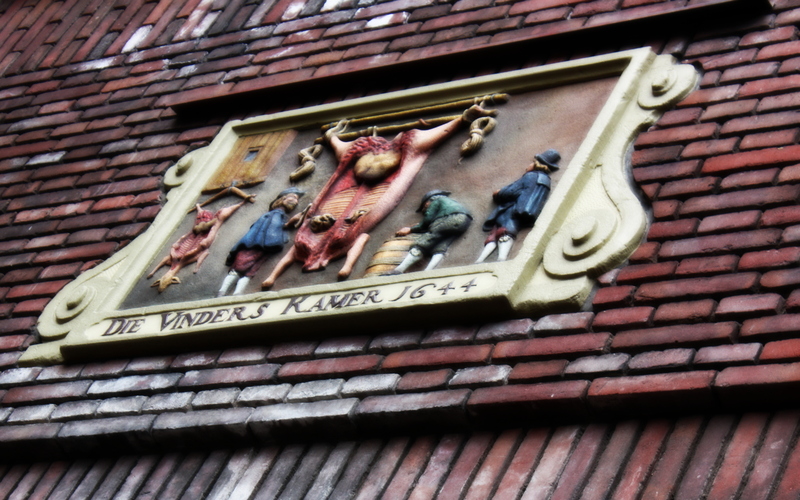 In 1525, the first meat halls opened in Amsterdam, wherein ‘vinders’ checked the quality of meat. Many of these halls were located in former monasteries and Catholic sanctuaries, which after the city became protestant, often stood vacant or without a specific purpose. Justice & environmental consequences: eating paper? At the end of the tour, we discussed the environmental and social consequences of food; for example it takes 10 calories of energy to produce one calorie of food in the modern “efficient” agricultural system. Moreover, the (real) cost of food has drastically reduced: 30- 40 years ago, the average person spent 30% of their income on food; 5 years ago, this was about 10% (in the industrialized world). Food is undervalued in industrialized countries where citizens can afford to be ‘squeamish’ (and selective) about what they will or will not eat. We also spoke about food & justice issues, including a project in the UK called “Keeping pigs in the City.” Pigs are taken care of by a community and eventually slaughtered. Through this, the visibility of farm animals increases, as does respect for the animal and value for eating all parts of the animal. Another project “Snap Gardens” supports low-income families in NYC to use food stamps for seeds to grow their own food. Another fun idea? 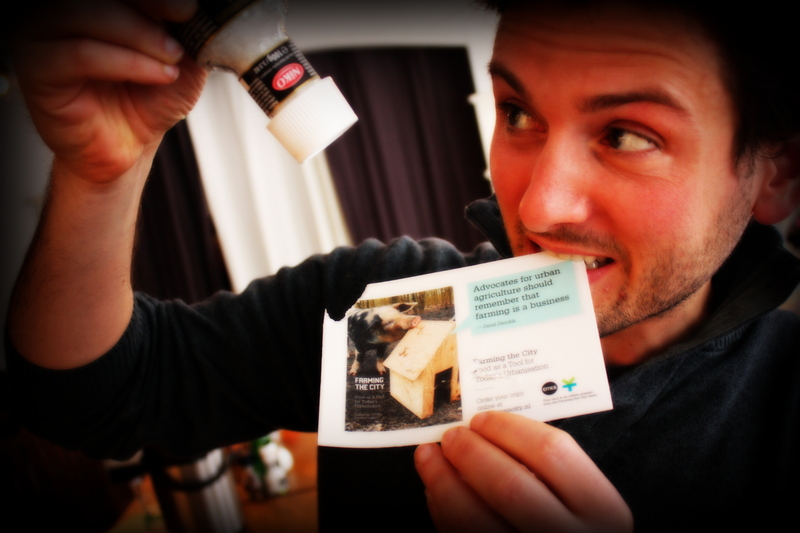 CITIES constructed edible paper (photo) to advertise its upcoming book release of “Farming the City: Food as a tool for today’s urbanization” to be released 10 April at 20.00 at Pakhuis de Zwijger, Amsterdam. Check their website!